Tweens and teens enter the realm of orthodontia with questions and concerns. Some are excited, many are wary, but they can all have a better and more positive experience with the understanding of their parents and the help of their Woodinville orthodontist. Here are four tips to help get your child ready for teen braces. Make it a group decision. 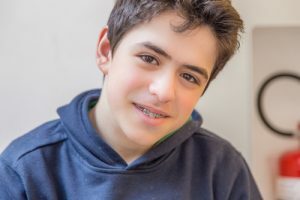 Yes, you’re footing the bill, but it’s your child’s mouth those braces will be going in – let him have a say in the treatment so he feels ownership over the braces and feels the responsibility of caring for them. There are plenty of orthodontic treatment options, and your Woodinville orthodontist will tell you what will work best for your teen’s alignment issues. Sometimes, a treatment other than metal braces will work. Ceramic braces blend in with tooth enamel so they’re not as noticeable. Invisalign Teen is nearly invisible. Find the best solution that works for your teen. Plenty of teens see orthodontics as an annoying rite of passage, but it helps to point out the perks of this experience. Straight teeth are strong, healthy teeth. When teeth are in alignment, they’re easier to clean, which means less chance of tooth decay and other oral health problems. An aligned jaw means less chance of teeth grinding and clenching, which eliminates any potential TMJ problems, pain, and issues like enamel erosion and gum recession. Getting your teen to see the positives of the future for the temporary discomfort of the present can help them accept their braces and follow the rules of being an orthodontic patient. Think of braces the same way you thought of your child’s first visit to the dentist so many years ago: The less said the better. Don’t promise that the braces won’t hurt, that they’ll only be on his teeth for a year, that he can still eat whatever he wants. Stay positive and leave the specifics to your orthodontist. How long will it take for you to put the braces on? Is putting the braces on going to hurt? Will braces make me talk funny? How often do I need to see the orthodontist? Will my mouth hurt all the time? What foods do I have to stop eating? Braces aren’t always easy to adjust to. There will be discomfort in the beginning and awkwardness. Teens are already in that phase of life when they’re self-conscious and hyperaware. Braces will exacerbate these feelings. Let your child know that you understand their discomfort and embarrassment. Do your best to boost their confidence. Choices like Invisalign Teen, if your child is eligible, can go a long way toward dulling the sting of having to wear orthodontics since they’re discreet and removable. Is your child ready for teen braces? Contact us today to schedule your consultation with orthodontist Dr. Soleil Roberts in Woodinville, Washington. Does Your Little Kid Need Braces?